The Cosmopolitan is a unique destination in the heart of The Las Vegas Strip. This luxury resort & casino is unlike any other. Enjoy oversized living spaces with private terraces and breathtaking views. The Cosmopolitan’s one-of-a-kind restaurant collection features world-class chefs making their Vegas debut including David Chang, Scott Conant and José Andrés along with authentic dining options by famed restaurateurs Costas Spiliadis, The One Group and brothers Bruce & Eric Bromberg. Stylish design and art engage cultural sensibilities while a vibrant nightlife scene captivates perceptions. The Pool District offers panoramic views and unrivaled service. Combine it all with an eclectic mix of hand-selected boutiques, a state of the art casino, Marquee Nightclub & Dayclub, and the serenity of Sahra Spa & Hammam to redefine your luxury resort experience. Dining is reinvented at The Cosmopolitan with a distinctive restaurant collection. Here, you will find an assortment of restaurants unlike any other in the world, with inspired cuisine by non-traditional chefs and a dynamic scene only The Cosmopolitan can create. With numerous unique restaurants to choose from, you will undoubtedly elevate your dining experience. Rose. Rabbit. Lie. is a modern supper club serving reinvented American classics, paired with live music and intriguing performances. With roots in the social clubs of eras past, Rose. Rabbit. Lie. takes you by the hand and leads you on an evening of surprising twists and turns, fueled by cocktails mixed with subtle flair and live entertainment that’s as spontaneous as it is extraordinary. Blue Ribbon is built on a vision that originated 25 years ago with two brothers and one small restaurant in New York, which grew into a beloved city staple “where chefs go to eat.” Bruce and Eric Bromberg are famously known for introducing signature items such as oysters on the half shell, beef marrow and fried chicken to the forefront of the national culinary scene back in 1992. 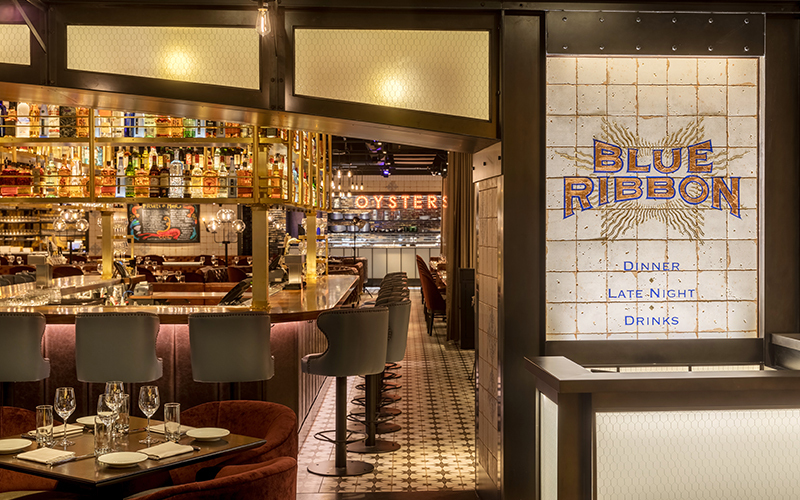 Now, at The Cosmopolitan, Blue Ribbon builds on that original vision and draws inspiration from the bustling energy of the Las Vegas Strip—part saloon, part oyster bar, part American eatery, and part international culinary tour. Michelin-starred, James Beard Award-winning Chef David Chang makes his West Coast debut, bringing dishes inspired from all over the world, including the U.S., Korea, and Japan. Chef Chang’s noodles, buns, fried chicken with caviar, and celebrated Bo Ssäm all make an appearance. Which means you’ll want to make one here too.